Yesterday when I got dressed for work I knew they were forecasting triple digit heat and 40 mph winds. Capris and my bling flip-flops seemed rather appropriate since I would be spending my day in the office. Or so I thought. Later in the day my office phone rang. It was my mother and from the sound of her voice I knew something was wrong. There was a grass fire by their house, and she was headed home to check it out. I packed my computer up and headed her way since she had my son. On my way, I called my sister who lived just north (between 1/4 and 1/2 mile) of the fire. She was frantically loading horses and trying to get things lined out at her place. I checked on Shaun and went to my sister’s. We loaded her mare and her 4 month old filly (she’d already had 6 other horses loaded) and pulled the pickup and trailer into the drive so a quick escape could be made if needed. After setting out some sprinklers around the house we got a game plan “just in case” we needed to get the other three horses off the place. For a couple of hours we switched from cooling off in the house to standing on her front porch watching the firemen work. There was one particular spot they couldn’t get to and douse the flames, and had to just let it burn. That was pretty unsettling sitting in her dining room and looking out the window to the south and seeing smoke and blackened earth. I’m nearly positive everyone who lived around this grass fire is truly grateful for the Ford County Fire Department and several rural fire departments that responded. I about took them some water, but would have had to run to town to get some to do so. The Red Cross beat me too it, and from some of the looks of the firemen out there, they needed some shade, water and rest. The 100 degree temps and 40 mph winds sucked the life out of them. After a couple of hours the firemen slowly started to head back to town and all the excitement was gone. My sister was still on alert, afraid the flames might come back since the wind was still howling. She unloaded the mare and filly and tied the rest to the trailer just in case she would have to load them again in a couple of hours. I texted her at nearly 10 p.m., and she couldn’t see any flames. The wind today has been much better, but yesterday’s excitement will not soon be forgotten. I am contemplating putting an old pair of shoes and a pair of jeans in my pickup just in case I choose poorly when I get dressed in the mornings. It couldn’t hurt. How much help can one be in flip-flops in case of an emergency like this? 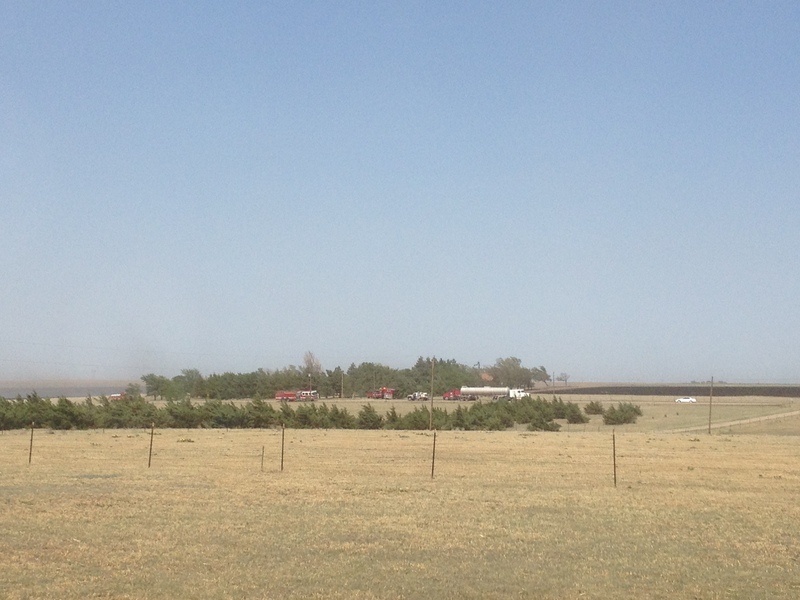 Standing next to my sister’s house looking south at the grass fire. My dang iPhone just couldn’t do it justice. This was the view from my parent’s front door. Since horses are a big part of my life, and their care is a priority to me, I often look for ways to make chores a lot easier. In the mornings, I normally hit the snooze several times and don’t get out of bed the first time the alarm goes off so my day’s often start out in a rush. Not much fun, but I make it work most mornings. On New Year’s Eve we got a snow storm. This time it was pretty snow that fell from the sky with minimal wind and ended up being about five or six inches in places. Most often in Western Kansas, our snow doesn’t fall, it comes horizontally, blown by cold, gusty North winds. This time too it was bitterly cold, but not quite as bad because of the lax winds. 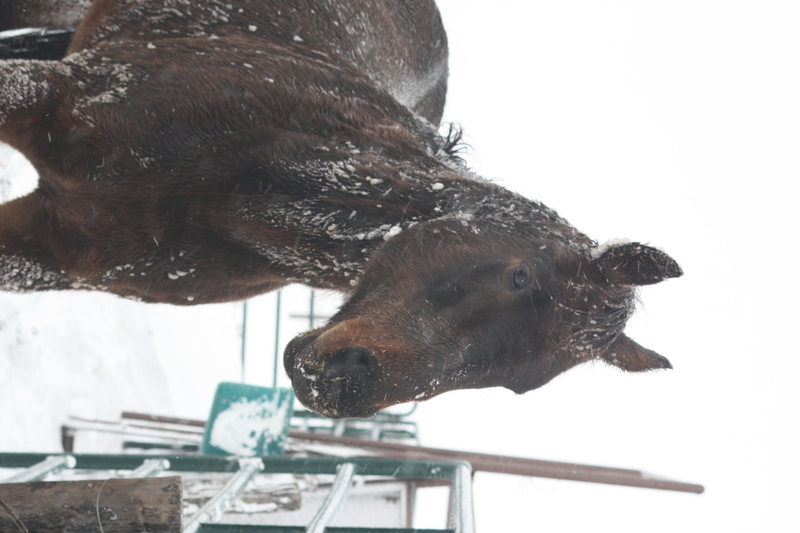 However, single digit temps made feeding horses a bigger chore than it really was, plus with the snow on the ground it just made doing chores cumbersome and take longer. First you had to bundle up like you were in the Arctic (Ok, not true but I despise the cold). In regular weather a Carhartt coat and heavy sweat pants (shorts in summer) and tennis shoes comprise my feeding attire. During this week of cold and snow, I donned the Carhartt, bib coveralls and snow boots. Then you had to chop ice. I don’t mind chopping ice in a big tank. One that has some size to it and there’s no fear of puncturing it or breaking it when the axe hits the ice. Plus, when its zero degrees out any liquid freezes where it falls. That could be your face, your eyelashes or coat. By the end of the second day my horse’s tubs were frozen solid and no amount of chopping could clear out enough room for a bucket full of fresh water. I finally resorted to a small plastic tub that wouldn’t be a total loss if I broke it and it could easily be picked up and dumped out. In the last two days it has gotten warm enough during the days where the ice bricks/blocks have melted a little. Last night I was able to dump the big ice cubes out and fill the tubs with clean water. Success! I got my coat and gloves wet and my hands were cold, but NO MORE ICE! I was pretty excited. However on my walk back to the house my excitement over the victory against the ice was dampened some by the fact that I realized ice-free horse tubs made me happy. Really? In my 34 years on this earth, that’s something that makes me happy? I guess I’ve gotten simple, but it works! Kate waits for her evening meal, Jan. 1, 2013. 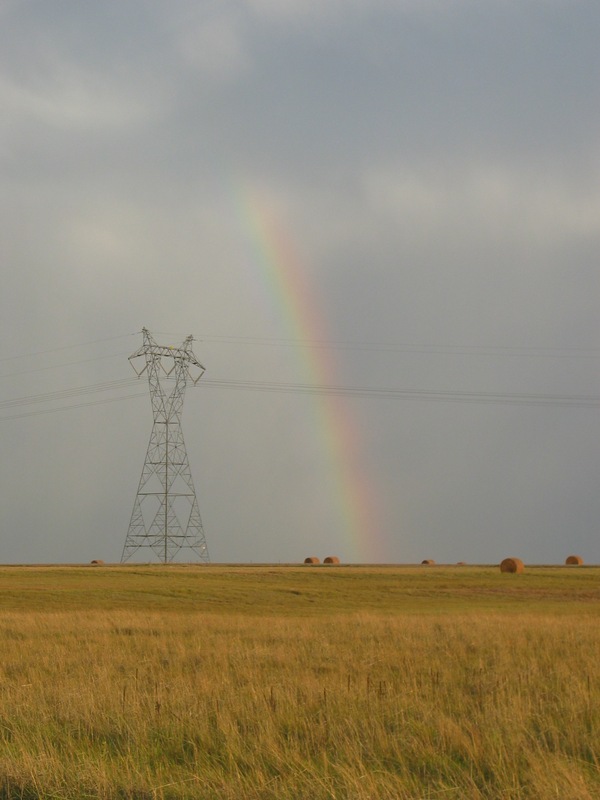 I grew up in western Kansas, so I should know what to expect with the weather. I currently live in western Kansas, so I know what the weather is capable of. 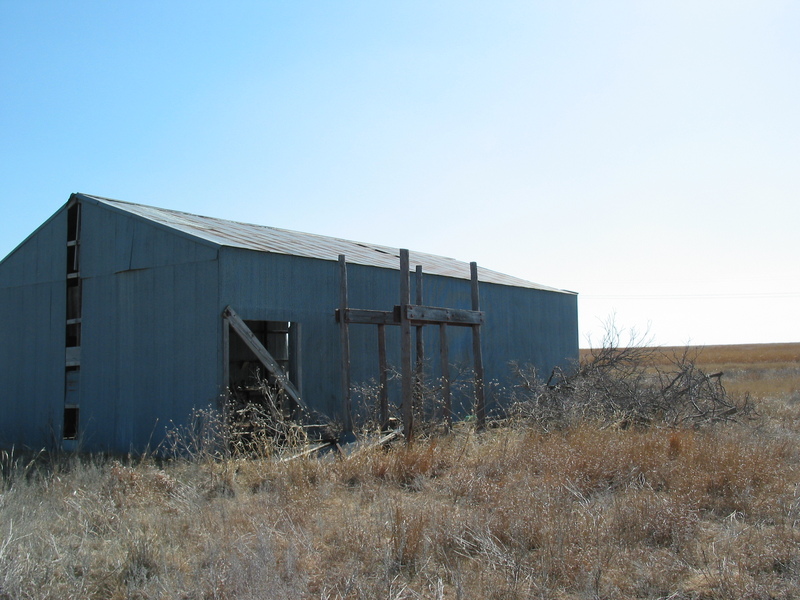 The wind blows in western Kansas, and I know this. See a pattern here? You would think I’d be used to the wind. I’m not. I despise it. The last couple of days we have been under some sort of wind advisory, wind warning or a fire danger advisory. Nothing new in this part of the word. The last two days we have had high temperatures. Saturday it was 85 and yesterday it was in the 90s. My sister and I hosted a barrel race in Garden City on Saturday. We initially scheduled the race to be held indoors because it was the end of March and you never know what the weather will do in western Kansas. The forecast on Wednesday was saying 85 and light wind for Saturday. We decided to move it outdoors. 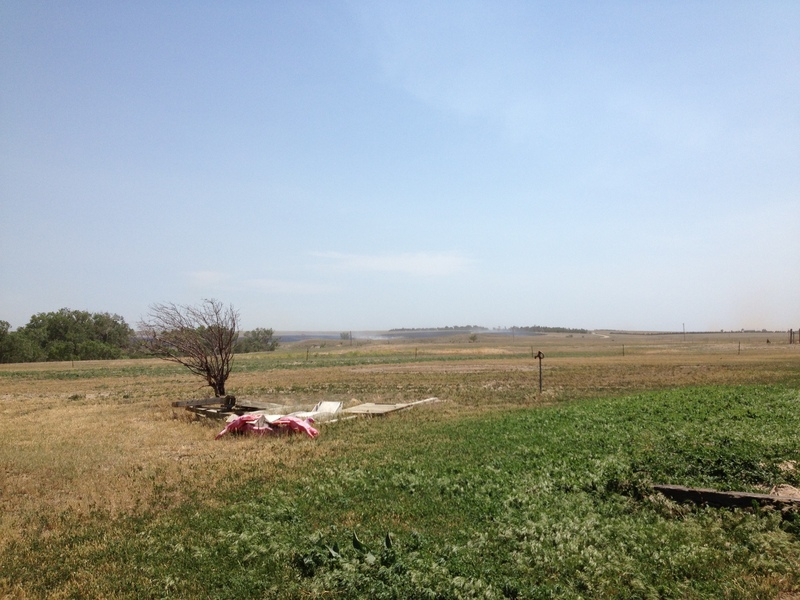 We get to Garden City to set up for the race, and of course, the wind has to blow. Not bad, but enough to be an annoyance. Yesterday we went to Elkhart for a barrel race and boy was it nice when we got there. It was cool enough to need a jacket and a very light breeze. I even mentioned to a friend that I’m not even going to say anything about how nice it is without with w-i-n-d. Spelling it out made me think the man upstairs wouldn’t hear me complain. But by the time it was our turn to run the wind had picked up and it was getting to not be very much fun to be out in it. The drive home was not much fun in my short-bed pickup and the wind pushing us around. We did make it home in one piece. Now I hope this wind is blowing in some rain for us. At least the wind might be good for something..
Today it’s supposed to be 70 degrees and wind of course. Nothing like nice weather to make me wishful for springtime. Here’s to green grass (and lots of it) and warm weather. Here’s a photo of mine from August 2011. I normally try to give my horse some time off during the winter for two reasons: 1) it’s normally too dark to have much time to ride after I get home from work; and 2) a break is good for her and me too. However when February rolls around I try to get back into some sort of routine with my horse. As I look at the calendar today is already Feb. 10. Where did the first ten days of this month go already?? So, that means I have roughly 35 days to get some rides on my horse before the first big barrel race I would like to enter – the Barrel Bash at Hutchinson, Kan., March 16 to 18. Really don’t want to be the out-of-shape barrel racer flopping around on the back of her horse looking like Whiplash the monkey. 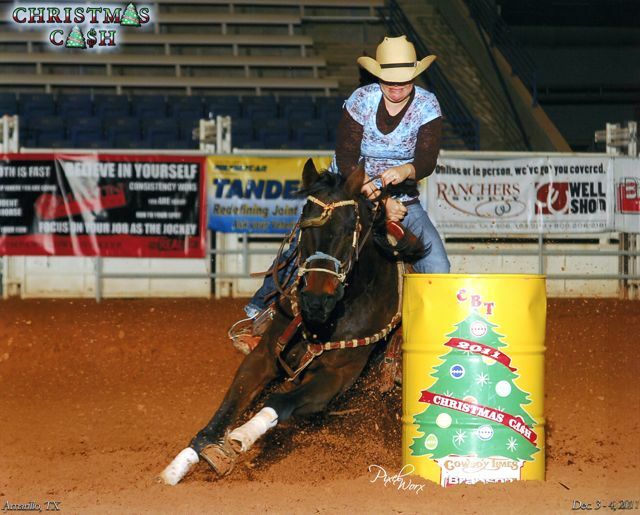 Our last run of 2011, Christmas Cash race, Amarillo, Texas. That’s all fine and dandy since my horse is finished and doesn’t require any tuning on the barrel pattern. But when I get home from work and its 40 some degrees and the temperature is dropping, my recliner has a way of sucking me in as does the fuzzy blanket. I used to be the kind of person who couldn’t wait until 5 o’clock and I would race home and get on my horse. But since it has gotten colder and I have got some age on me, my drive to be horseback in the evenings has waned. I hate that it has happened, but what can I do? Some people wonder where their mojo has gone, me I have lost my motivation. If someone finds it please send it back to me. I will pay shipping. However, I don’t think my mare would mind too much. 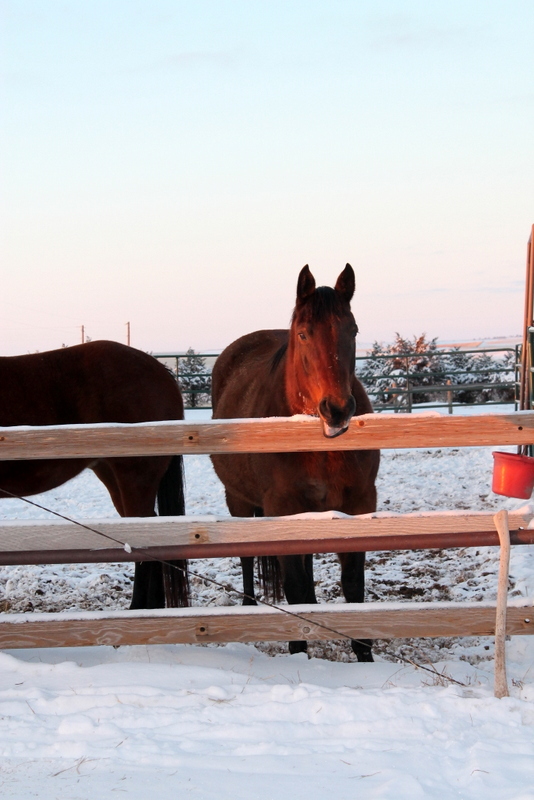 My mare during the December 2011 snow. Yesterday I worked at home and by mid morning the tin flapping on the shed outside the back door was about to drive me nuts. Thankfully, the volume on the TV and my little boy’s babbling partially drown out the sound. Remind me to help my husband when he’s tacking the tin back on the half-falling down shed.. 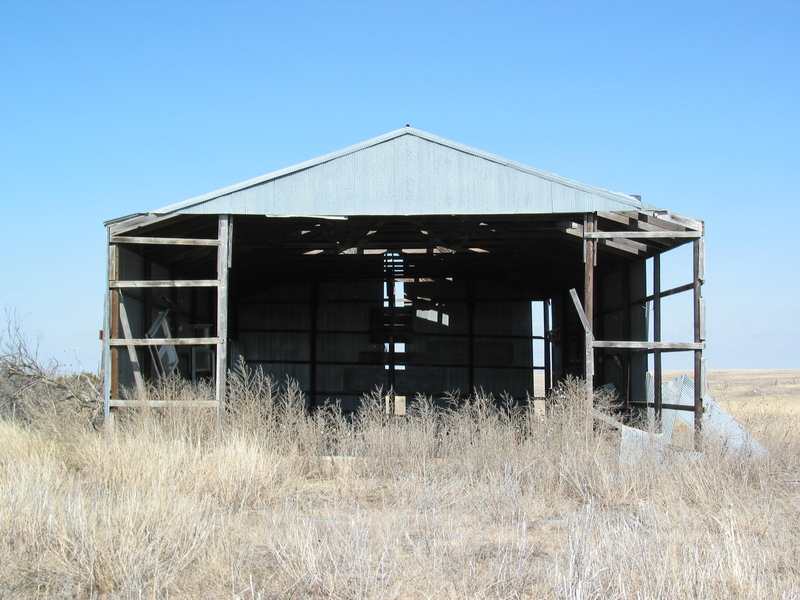 The bad side of the shed. Taken before the house was built. Wind is nothing new where I live. Most of Western Kansas was under a wind advisory yesterday and it was extended to today. I despise listening to the wind blow outside our house and as I tried to open the back door to go feed the horses it only solidified that hate. And I don’t hate very many things. I worry about the wind even more since my husband started trucking two years ago. When he was hauling grain, it wasn’t as worrisome, but now that he’s hauling hay – large oversize loads that are much taller than the grain buggy – I picture the truck getting pushed by the 40 to 50 mph gusts. Today, he was smart and opted to stay home. But some days he has to push through, literally. But there’s got to be something good from having the wind blow occasionally, right? Surely there is. When I find it I will let you know.